This morning we bustled out the door to attend the annual neighbourhood bicycle parade, which we forgot about until 9:45 (and which begins at 10:00). Andrew took the car this morning because there's rain in the forecast, but it was certainly hot and sunny this morning (we'll see what the afternoon brings) so that meant we had to get down to the park by foot in order to join in the parade. Obviously that wasn't going to happen in time, so I sent the big girls off on their bikes so they could ride in the parade. I walked the little kids to the corner so we could watch the parade and join in at the end (Benjamin rode his tricycle). I wasn't sure we would make it in time, but we did! We found a nice shady spot by some neighbours and chatted while we waited for the parade to come by. It was led by a firetruck again this year, which Zoë found rather impressive. Miriam's bike still has Rachel's Gryffindor tassels on it from when we misunderstood what "best-decorated" meant and were the only ones who didn't get all bedazzled in red, white, and blue. 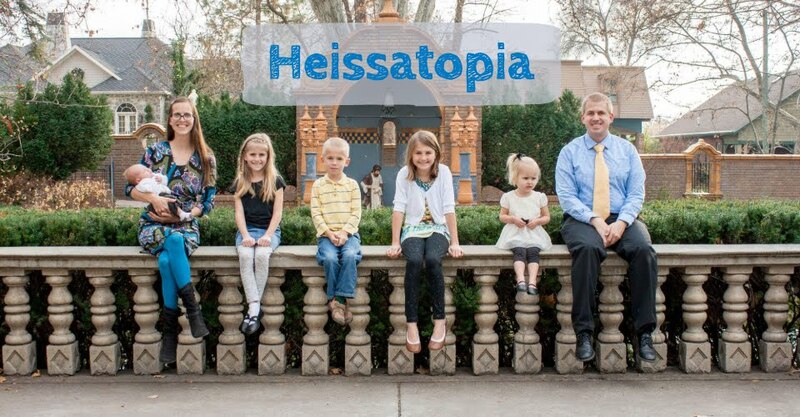 Can you spot any little Heisslings enjoying the spray? She got really excited about the blue part and started eating it like corn on the cob, which was a mistake. Poor Zoë didn't finish her popsicle until after the firemen had packed up their hose. I was a little underprepared for the whole toddler + popsicle equation so I just told her to splash in one of the freshly-made puddles and we dried her off with the same shorts we'd used as her bib. Totally MacGyvered it. 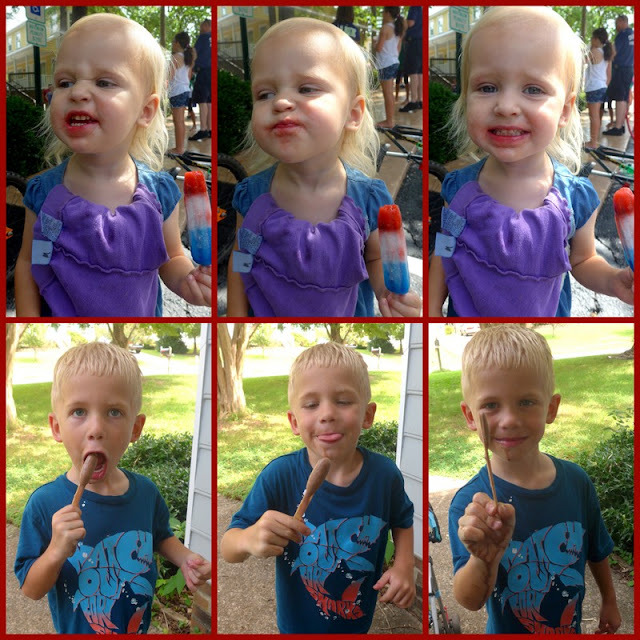 And here are a few more pictures of Zoë and Benjamin with their popsicles—they sure got messy! And then they had another popsicle at home while we were waiting for their sisters and got messy all over again! It was a fun morning and we have some more fun (with fireworks) planned with friends this evening, which is good because Andrew will be busy writing and like I was going to put on a fireworks show for the kids by myself (ha). I have to admit that I'm feeling a little unpatriotic and nostalgic this 4th (not that I ever get super pumped about Independence Day; it's just not in me...sorry) because it's Canada's 150th anniversary so there were huge celebrations up there and our Hancock reunion was held in Raymond this year and Raymond's Canada Day celebrations are near and dear to my heart and all of my family was there and I wasn't. So I've been feeling a teensy bit jealous. 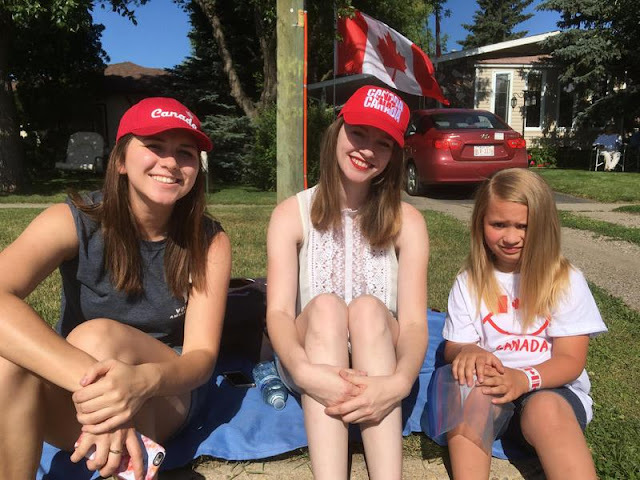 Part of me thinks it would be weird to go to Raymond for Canada Day and not hang out at my grandparents' house (because that's what we've always done—their house was right on the parade route; it was perfect) but it looks like everyone had fun in spite of the changes that time and mortality force upon us. Still, it was fun to look at all the pictures and videos everyone was posting, even if things were different and even if I wasn't able to be there. I don't think the Fourth of July would be so terribly difficult for me to celebrate fully if Canada Day weren't on the first of July. But maybe that's just me. Anyway, we should have a fun day together in spite of all the crazy going on over here. Happy Fourth (and Happy Canada Day)! Love the cartoon you posted! Also, the little cousin in the picture is named Emily. She is one of Ron and Deanne Hancock's grandchildren. Or possibly great-grand. She so loved "the girls."